^^Chris Wright uses this verse as a lens through which he surveys the Bible's teaching on 'salvation'. Every phrase in the verse resonates with significant themes in the Old and New Testaments, all of which combine to show that the Bible tells the story of God's salvation very broadly indeed, in relation to the character and purposes of God, the death and resurrection of Jesus Christ, the redemption of all creation, the joy of Christian experience and the responsibility of Christian mission. 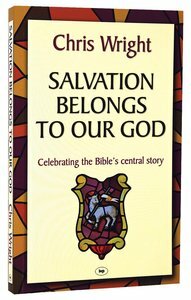 About "Salvation Belongs to Our God (Re-issue)"
A great multitude that no one could count . . . cried out in a loud voice: "Salvation belongs to our God, who sits on the throne, and to the Lamb. "Every phrase in Revelation 7:10 resonates with significant themes in the Old and New Testaments. Christopher Wright views the story of God's salvation through the lens of this verse to show the great breadth of God's saving work: the character and purposes of God, the death and resurrection of Jesus Christ, the redemption of all creation, the joy of Christian experience, and the responsibility of Christian mission. This clear, deep and warm-hearted exposition enriches our grasp of the Bible's multifaceted teaching about salvation. Christopher J. H. Wright (Ph.D., Cambridge) was born in Belfast, Northern Ireland. His doctorate is in Old Testament ethics. He taught Old Testament in India for five years (1983-88) at Union Biblical Seminary, and then returned to the faculty of All Nations Christian College, a missionary training school in England, where he was principal from 1993-2001. Wright is now the international director of the Langham Partnership International (known in the United States as John Stott Ministries), providing literature, scholarships and preaching training for pastors in Majority World churches and seminaries. He has written a number of informative books for thinking Christians including commentaries on Deuteronomy (New International Bible Commentary) and Ezekiel (The Bible Speaks Today), Old Testament Ethics for the People of God, The Mission of God, the Trilogy Knowing God the Father through the Old Testament, Knowing the Holy Spirit through the Old Testament, and Knowing Jesus through the Old Testament and The Uniqueness of Jesus. An ordained Anglican, he serves on the staff of All Souls Church, Langham Place, London, England. His most recent publications are The God I Don't Understand: Reflections on Tough Questions of Faith and Salvation Belongs To Our God.